Portugal essentially ended Morocco’s World Cup this morning with a frustrating 1-0 win. Ronaldo scored off of a corner kick in the fourth minute, and Morocco couldn’t find the back of the net despite creating several great chances. 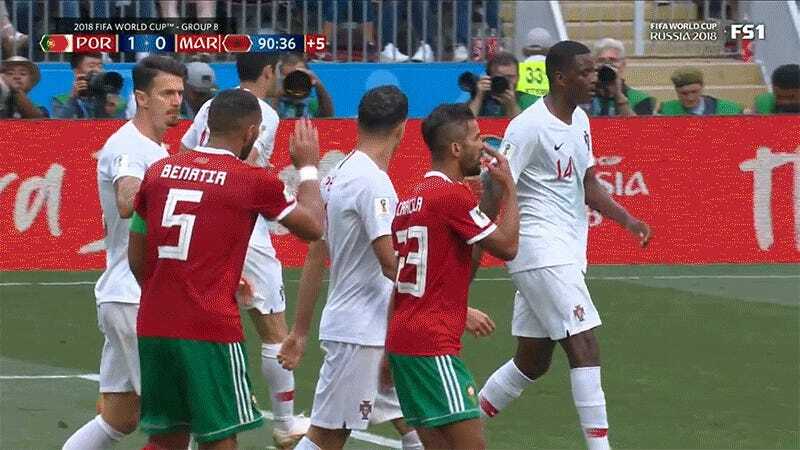 Because Portugal are Portugal, they stalled out the end of the game with several breathtaking dives, though none was as good as Pepe dissolving into a screaming puddle when Medhi Benatia, uh, patted him on the shoulder. Thank you to the brave World Cup referees, who protect the players from firm hands on their shoulders.